Mrs. Carnell Lovelace Watson, 88, died Monday, April 15, 2019 at Magnolia Manor in Tupelo where she had resided the last 4 years. Carnell was born September 7, 1930 in Calhoun County, Mississippi to James Leonard Lovelace and Gladys C. Burt Lovelace. After graduating high school, she continued her sturdies at Wood Jr. College earning an Associate Degree, then Mississippi State University. She received two Masters Degrees in Elementary Education and Remedial Education from the University of Mississippi. 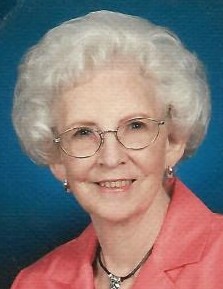 She married Charles Dudley Watson on May 30, 1954. They moved to the Palmetto Community of Lee County in l970. Carnell loved children and taught music education first then finished her teaching career of almost 25 years as an elementary teacher at Verona School. She was a masterful housekeeper and a doting mother and grandmother. She enjoyed gardening and flowers but her main chore was keeping her husband, Charlie, on the straight and narrow. She was passionate about getting her hair done every Thursday by Helen Harris. A longtime member of Harrisburg Baptist Church, Carnell lived a long and fruitful life and will be fondly remembered by a grateful family and many friends. A celebration of life service will be held at 11 AM Good Friday, April 19, 2019 at the Tupelo Chapel of Holland Funeral Directors with Bro. Robert Armstrong officiating. Private family burial will follow at 2 pm at the Calvary Baptist Church Cemetery near Eupora. Visitation will be from 4 PM-7 PM Thursday and from 10 AM-service time on Friday. The service may be viewed at www.hollandfuneraldirectors.com/Livestreaming at 11 AM Friday and for 3 months following. (Anna), Jessica Hawkins (Jay), Shane Watson (Lauren) and Shannon Cooper (Josh). 5 great grandchildren, Maddie, Zakk, Gavin, Hayes and Kenton. One brother, Jim Lovelace of Horn Lake, and a host of nieces, nephews and cousins. She was preceded in death by her parents and a sister, Jane McGeehee. Pallbearers will be nephews and cousins. Memorials may be made in her honor to Sanctuary Hospice House, P. O. Box 2177, Tupelo, MS. 38802.